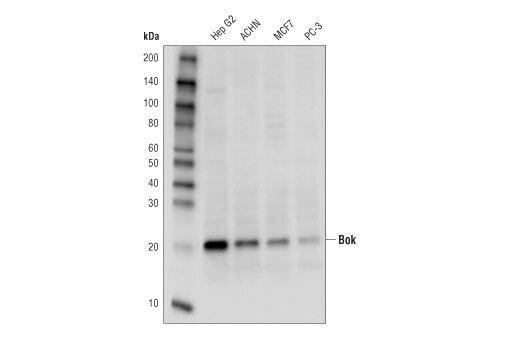 Bok (D7V2N) Rabbit mAb recognizes endogenous levels of total Bok protein. 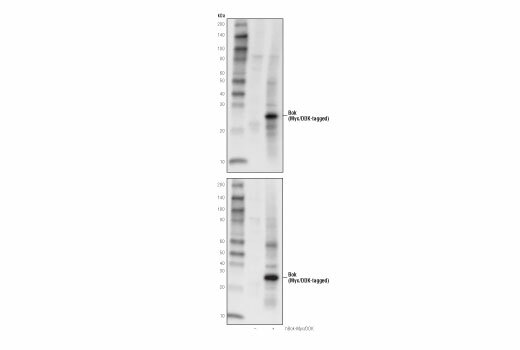 Monoclonal antibody is produced by immunizing animals with a synthetic peptide corresponding to residues surrounding Val88 of human Bok protein. Like other family members Bok was identified based on sequence homology and interaction with select anti-apoptotic family members (6,7). Although Bok was originally described to be predominantly expressed in reproductive tissues such as ovary, testis and uterus (6), subsequent studies have found selective expression of Bok in a number of adult and development tissues (7). The Bok gene is frequently mutated in human tumors, suggesting a tumor suppressor activity (8). While Bok is structurally similar to the pro-apoptotic proteins Bax and Bak, it appears to be functionally distinct. Loss of Bok in mice did not have an overt effects phenotype (9). However, additional studies have shown that Bok plays a distinct role in apoptosis in response to endoplasmic reticulum stress (10,11). The stability of Bok is regulated by the endoplasmic-reticulum-associated degradation (ERAD) pathway (11). Bok expression is induced by proteasome inhibitors and triggers apoptosis by these agents (11). Hsu, S.Y. et al. (1997) Proc Natl Acad Sci U S A 94, 12401-6. Inohara, N. et al. (1998) J Biol Chem 273, 8705-10. Beroukhim, R. et al. (2010) Nature 463, 899-905. Ke, F. et al. (2012) Cell Death Differ 19, 915-25. Carpio, M.A. et al. (2015) Proc Natl Acad Sci U S A 112, 7201-6. Llambi, F. et al. (2016) Cell 165, 421-33.